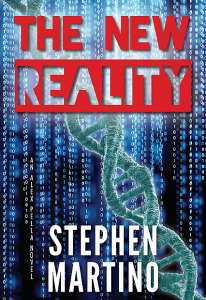 Quite possibly the best thing about Stephen Martino‘s debut novel, The New Reality, is the fact that the action is fast-paced from the very beginning! There’s nothing worse than picking up a new book, getting excited to get into the story that you read about on the back cover, and then having to trudge through 100 pages of back story just to get things going. Martino avoids that entire concern by just getting right to the point and that, alone, made this one of the best thrillers that I’ve read in years. The fast-paced action aside, I also enjoyed the story that Martino tells – even if it may be a harbinger of things to come. Martino does an excellent job of bringing the reader into the panic that surrounds The Disease and, particularly, the desperation that Pella and his team feel as they try to find a cure before it’s too late. Unlike many recent releases in the thriller genre, The New Reality brings the reader a fast-paced, action-packed adventure that moves as fast as you can flip a page. There are no long, drawn out segments of the book to bore you to tears. Instead, Martino writes in a style closely resembling that of Dan Brown and Harlan Coben. And that is the style that this story needs to be told in because of the amount of movement that the characters experience during the story. One chapter takes place in America while the next chapter takes place in a high-tech, super-fast airplane while the following chapter might be in Israel or somewhere in the Arabian Peninsula. If you like reading a strong “thrill of the chase” novel that actually has a significant story to tell, then this is the one for you. And watch out for the storyline extension at the end of the novel – it’ll leave you hungry for the next book in the Alex Pella series! The New Reality is the perfect book to read while you’re laying on the beach this summer, too. As I’ve noted, the story moves quickly and Martino moves the core discussion along in each chapter. You won’t be left waiting for dozens or hundreds of pages to find out why a certain character said something in a prior chapter – the answers are given to you as fast as you can read them and put the pieces together. Martino’s experience as a neurologist certainly plays into his ability to write a strong medical-based thriller. If you’re a fan of this genre, looking for a great book to read this summer, and/or just looking for a book that has characters with depth, a story with resonance, and a real lesson to teach today’s political leaders, then The New Reality is for you. Plus, based on the high level of quality in his first novel, I think we’ll be seeing more of Martino in the literary world. Give the Alex Pella story a shot – I really think that you will enjoy it. I definitely did! We’re all trying to make some sense of the aftermath of this hurricane and the impact that it had on our beloved state of New Jersey. Through the recovery and rebuilding efforts, there are a few thoughts that keep coming to my mind. And, since I have this nifty little blog right here (which had more hits in a single day than any other day in its history this past November 1, 2012 due to pictures and videos from before and after the hurricane), I thought I’d share them with you! I’m interested in your thoughts in the post-Hurricane Sandy environment, too. Feel free to use the comment system below this entry to share your thoughts. Here we go! Governor Christie Is In Control. Thank God we have a leader like Governor Chris Christie in charge of New Jersey during this chaos. I don’t care if you’re a Republican or a Democrat, you have to respect the way that Christie took on this situation directly and without any delay. He warned people well in advance to get out of certain areas of the state. He is on-site managing cleanup and recovery efforts. He isn’t making stupid decisions like attempting to hold a marathon in the middle of the mayhem (a rare miss by New York City’s Mayor Michael Bloomberg). Christie is doing an amazing job for the state and I’m glad that we have him on the job during this time. The Governor Throwing Politics to the Side. Again, unlike some of his pathetic predecessors, I have to praise Governor Christie for his direct statements about President Barack Obama and the leadership that he showed during his visit. When a FOX News reporter asked Governor Christie about how he felt about potentially giving Obama a pre-election bump in the polls after thanking him during his visit, this is what Christie said: “I endorsed Mitt Romney 13 months ago because I thought he was the best guy for the job and on Tuesday I’m voting for Mitt Romney because I think he’s the best guy for the job. But it doesn’t mean that I can’t turn the President of the United States of American and say to him ‘Thank you, sir, for providing good leadership during this crisis and for helping the people of New Jersey,’ and to extend my hand of friendship to him.” Can you imagine a liar like Governor Jim McGreevey or Governor Jon “Money Bags” Corzine giving as direct and noble an answer as Christie did? The Immediate Post-Hurricane Shoppers. What I really don’t get about the aftermath of the hurricane are the people who stormed the grocery stores and left with wagons and wagons filled with food. First, didn’t these people do the same thing not but two days earlier when the entire state was in a panic over the pending storm? And if they did, then did they eat through a wagon (or two) filled with groceries in just two days? Stop eating so much! Second, if these people did not fill up their pantries and refrigerators prior to the storm hitting… why not?! What part of a major storm aiming directly for our state did you not understand? Get with the program, people! Staten Island is Decimated. I can’t believe the pictures and video coming out of Staten Island. Seriously, if you’ve not seen these pictures, then you need to do a Bing or YouTube search and you’ll see the devastation that I’m talking about. It’s absolutely unbelievable. I’m going to comb through some of my clothes to see if I can donate some of them to the people who lost everything in the storm. There Are Always Dumb People. If you live in New Jersey, then you’ve probably tuned in to NJ 101.5 at some point in the last week. I heard one called say that she was really upset that there was so much focus by the utility companies on the Jersey Shore region and not where she lived up in Northwest New Jersey where she was without power, too. Typically, I’m with this woman and I think that the people in Northwest New Jersey are often overlooked when it comes to government-regulated services. But what really irked me was what this idiot mentioned in her rant. She said that the utility companies were disregarding the people in her area because “we don’t live right on top of each other like it’s the Third World like they do down the shore.” What a moron. The hosts of the radio show were quick to tell her that what she thought was her biggest selling point – that the people in Northwest New Jersey live in a geographically dispersed region – was actually what was preventing the utilities from focusing on them. Anyone with half a brain realizes that these utility companies have to get power to the most people as quick as possible. So they’re obviously going to choose to restore power to those areas that are heavily populated versus those that are widely dispersed. I wanted to call in to this woman and tell her that if she was annoyed that this happened all of the time, then she should go out and buy a generator. Yes, if you live out in the woods (like all of my family does and like I would like to do again some day), then you should be prepared to buy a generator for situations like this one. Get real, idiot. We’re a Strong, Hardy People. The populations of New Jersey and New York are strong. We’re a tough people, a hardy people. We’re the American versions of the British mentality of keeping a stiff upper lip. In other words, as soon as it was safe to go outside and start cleaning up and helping people recover their lives, we began working. Companies opened, neighbors helped neighbors once the power came back on, people began donating old clothes and other items in mass quantities, congregations began organizing food drives. This part of the Northeast megalopolis is packed with tough, stern individuals. We relish being challenged. We love overcoming adversity. We typify the American angst and, frankly, anger at being put off of our various courses in life. When things get bad, the New Jersey/New York population digs in fights back. This entire area will come back stronger for the effort. I was conflicted on whether or not to add a final thought in a final bullet point up there. The final thought relates to my last sentence in these bullet points about coming back stronger for the effort. I’m not entirely sure that we should be planning to come back in the same form or with the same function as we were before the storm hit. Let’s be honest – when the people who were living below sea-level down in New Orleans were obliterated during that storm, there were voices from throughout the nation saying that they should not be rebuilding in those low-lying areas that are prone to destruction. The same chorus can be heard each year when parts of the Gulf States and Florida, in particular, get battered by hurricanes. That same thought is running through my mind in the aftermath of Hurricane Sandy. Should we rebuild everything as it was or should we rebuild things differently? If you think we should rebuild things differently – how so? What should be different? Other than additional reinforcement of some of our structures, I don’t know what could have been done to protect against a storm of that nature. I’m interested in your thoughts, so please share them!